Is a Cotonese the Right Maltese Mix for You? They are a fluffy, all white Maltese mix that is growing in popularity because of their gentle and affectionate personality. 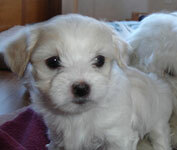 Read more about the Coton Maltese mix below to see if this is the right Maltese mix for you. Do you have a Cotonese? Tell us more about his/her personality & your dog could be famous! These dogs take on the temperament of both Coton du Tulears and Maltese. They are friendly and alert little dogs. Most are very smart; which makes them easy to train. They can become very attached to their owner and love to please. This eagerness and intelligence makes them the perfect dog to learn and perform tricks. They also do well in dog sports such as agility and flyball. The Maltese Coton de Tulear dog is very sociable and gets along great with children and other animals. Most people find them to have an enthusiastic and lively personality. If you already have a Maltese Coton dog mix or know someone that does, check out these unique gifts for dog lovers below. 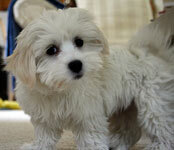 If you like a fluffy, white cottonball than this Maltese mix might be right for you! Since both the Coton De Tulear and the Maltese are white, this hybrid dog is also always white. Hair is usually long, cottony, and fluffy. These dogs should be brushed daily to keep their long hair free of mats and tangles. They are also nonshedding and most are hypoallergenic. Full grown Coton Maltese mixes can weigh anywhere from 6-15lbs. Do you have a Cotonese? If so, your Maltese mix could be famous! Please tell us all about your dog and we'll put it on our website. What kind of personality does s(he) have? What makes him/her so special? Let other Maltese Maniacs know what to expect from a Cotonese. Submissions must include at least 200 words of text and a picture to be accepted. Thanks!